Creating unique and fun lettering designs from BX fonts is so simple to do in Embrilliance Essentials. Because it is so quick and easy – we have plenty of time to play with our designs on the computer to see what we can create that is unique to our project – that is how this “ribbon” look lettering came about! 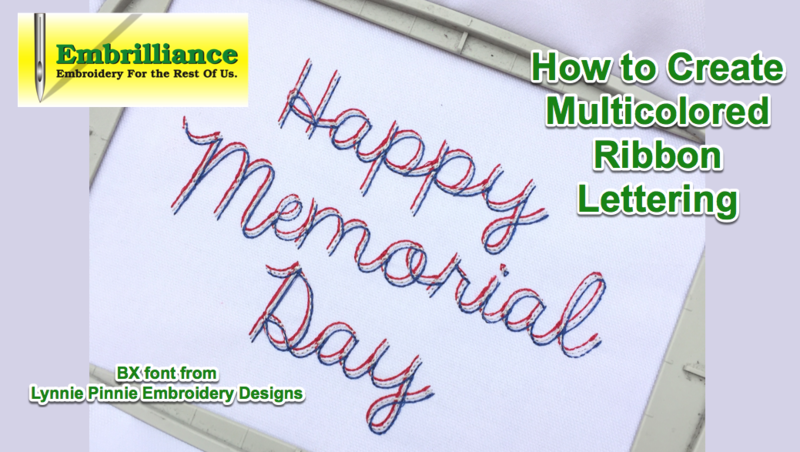 The script bean stitch font that I was working with is called Always a Good Time and it is available as a BX installation file from Lynnie Pinnie Embroidery Designs. As I was watching the lettering stitch in the Stitch Simulator, I noticed that each letter connected very smoothly to the next – like a continuous line drawing. As I was admiring the skill of this digitizer, I realized that if stitched it on the kitchen towel like I had planned, it would be rather “lonely” looking. On top of that, I was going to stitch it on a white towel, so should I choose Red or Blue thread? If only it were a two or better yet, three color font! Posted 1 year, 10 months ago at 5:08 pm. "What a wonderful man you are!!! What a fantastic piece of kit - I love it! Thank you so much :) :) :)"